Like most artists out there I am always working on a project whether it is personal or freelance. I just have a need to constantly be creating. Also, like most artists I am always looking for a way to make money off my art. During the day I teach traditional and digital art at a local college and when I come home I either freelance illustration and cartoon art or I am working on a project for myself. This experiment I am going to be doing will benefit both me as an artist and a professor. When I look ways to make cash and I think it would be beneficial to my students I pass along the information. Recently (within the last six months or so) I heard of a site called talespring.com. TaleSpring is a site that allows you to make digital books with motion for the iOS. Signing up is free but they only give you 25mg for free. They offer monthly subscriptions starting at $9.99 for 2 gigs and higher prices for higher gigs. You’ll have to pay for publishing on iOS which I’ve heard is about $150. Anyway, I have watched the videos on the site and think this be an interesting site to work with. So before I use it with my students I need to experiment with it and because of the limited file space I am going to do something really simple. 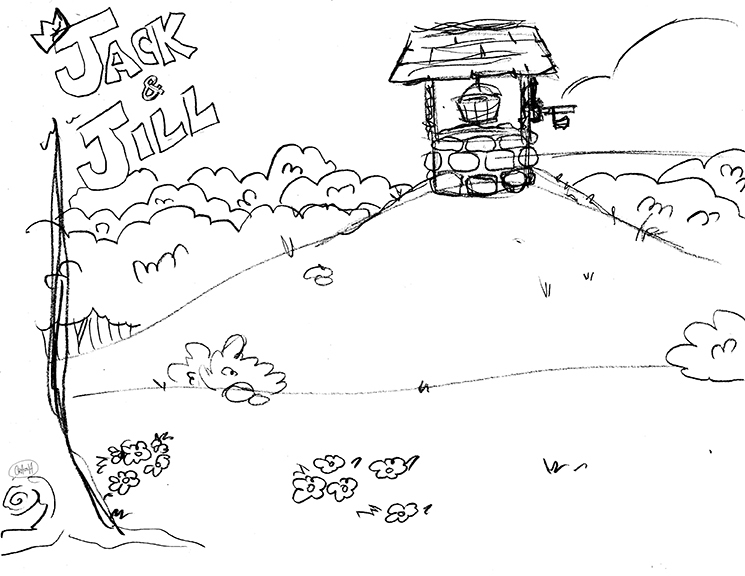 I always tell my students when you need a quick story to play with just go to a nursery rhyme or fairy tale, which I chose Jack & Jill. Earlier today I did a sketch of a background for the idea. I will play with the layout a bit but this is my concept for the cover. Over the next couple of days after I refine the concept I will build this with layers in Photoshop or Illustrator. I’m leaning towards Illustrator because it gives me the ability to create close up images without losing any resolution. The characters will be designed in the next couple of days as well and I think by Sunday I should have the artwork completed. I will post more as soon as I have more and keep you updated. Until next time, there is always time to GET IN TOON!